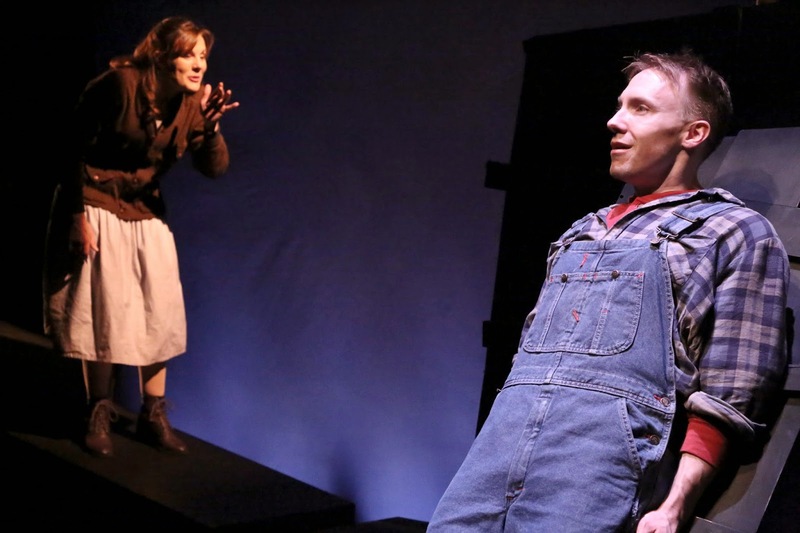 It took nine years for Adam Guettel and Tina Landau’s Floyd Collins, which debuted Off-Broadway in 1996, to finally premiere in LA and it’s hard to believe that the first company with enough vision to produce the complex musical here did so in a tiny theater with extremely limited resources. Somehow, using incredibly inventive direction and stagecraft, West Coast Ensemble and director Richard Israel created an unforgettable experience; one that I was fortunate enough to see and can only describe as theatre magic at its very best. 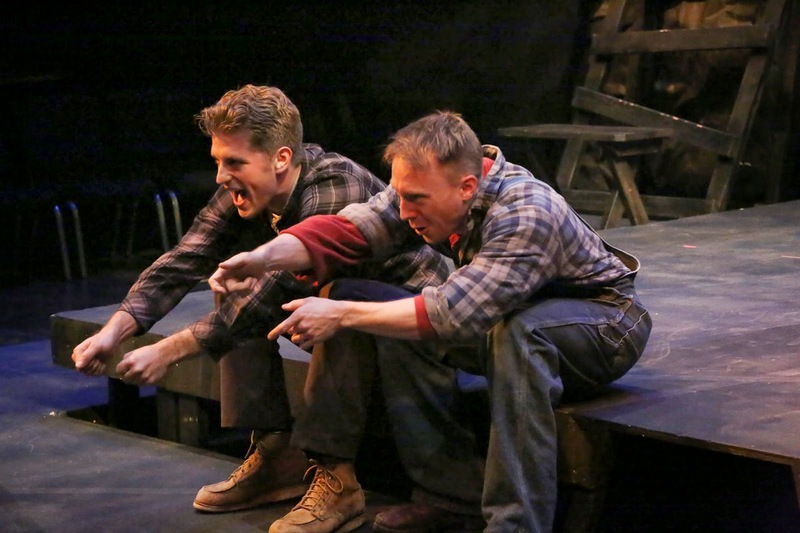 Now, another nine years later, Israel is directing an equally compelling and creative production of Floyd Collins as part of La Mirada Theatre’s ONSTAGE series. For the special series, artistic director Brian Kite brings the audience right up to the action by closing off the house and placing the audience seats on stage. 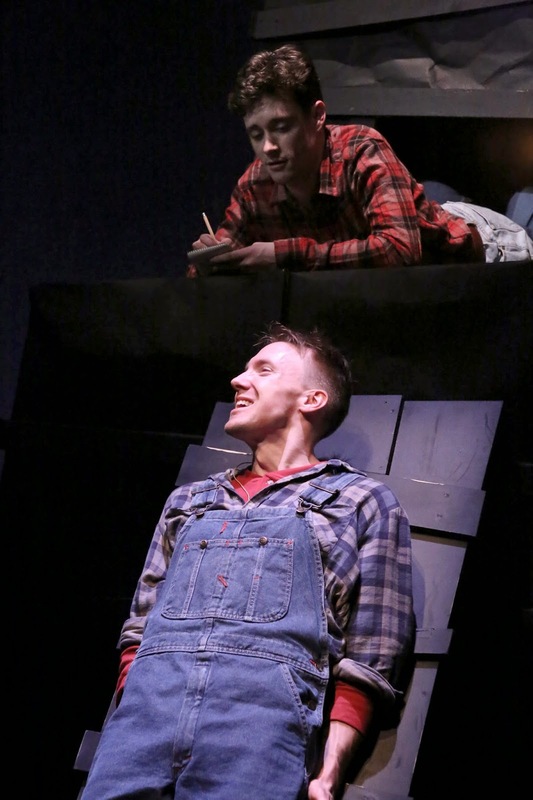 Last season’s Spring Awakening was the first of the series in the altered space and the experience struck a chord with audiences who couldn’t get enough of it. 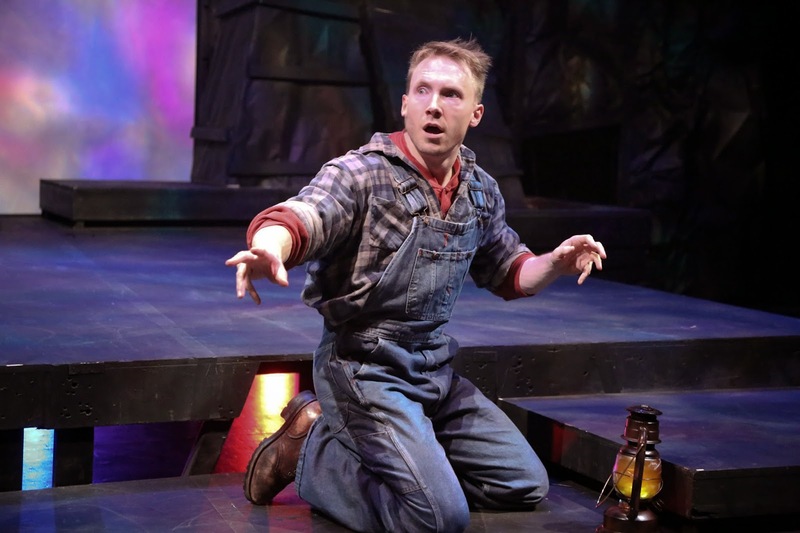 For Floyd Collins, winding your way through the reconfigured backstage area to your seat is the perfect prologue for a musical that takes place in the underground caves of Kentucky. The element of the unknown is present before it even begins. The true story of the events that took place in early 1925 would make Floyd Collins famous but not for the tourist attraction he hoped to discover. While searching for the perfect cave, Floyd was trapped by a rock that pinned him in a tight crawlspace far beneath the surface. The media frenzy surrounding his rescue attempt was unlike anything the public had seen since the Lindbergh kidnapping, and though efforts over a two-week period of time were ultimately unsuccessful, the name Floyd Collins would live on for generations. Guettel incorporates the mournful sound of the mountains and lilt of the Kentucky dialect into his stunning Bluegrass/operatic score making it an expressively rich vehicle for the storytelling. A simple lyric like “Deep in the land of the hollows an’ creeks, If’n you git lost you git lost fer weeks…” quietly eases the audience into the story; it’s haunting melody first sung delicately by Jewell Estes (Matt Magnusson) accompanying himself on guitar before strings and other voices melt together to layer in the sophisticated textures that characterize Guettel’s compositions. His music is revelatory, complex and difficult to learn but absolutely magnificent in the way it connects the emotional journey of its characters to the audience, prompting a powerfully empathetic response. Musical director David O employs great sensitivity in bringing its many colors to life, serving a directorial vision that focuses on the bonds of family, and the critical relationships that come into play in the middle of a crisis. This is weighty material for a musical and the cast handles it beautifully with an astounding amount of vitality and tenderness. When Floyd (Mark Whitten) plays with the cavern, joyfully singing echoes through the space like the cave itself is a playmate, it is impossible not to smile at the kick he gets out of his own adventure. And conversely, when fears overtake him while he’s trapped, it reaches us at the level of our own humanity as we witness his complete vulnerability. Whitten captures both Floyd’s childlike innocence and adventurous spirit with nimble dexterity in a breakout performance that is as charismatic as it is natural. Kentucky-born Kim Huber is superb as Floyd’s sister Nellie, a role she toured with nationally, directed by bookwriter Tina Landau. Her uncanny connection to Floyd is fascinating and Israel stages it much like she is his guardian angel holding vigil; in this case, an angel with a gorgeous soprano voice and the ability to bend it to Guettel’s vocal lines with surprising nuance. Also terrific is Jonah Platt as Floyd’s younger brother, Homer. With each role on an L.A. stage he shows increasing depth and this one takes him through a dizzying range of emotions. The love between the boys is evident as they laughingly roughhouse at the river, and when it comes time to soothe Floyd’s hysteria, Platt does it by playing a game in “The Riddle Song.” Anger, defiance, desperation and strength are all bound together in his memorable performance that builds upon what little the text gives him to work with. As Floyd’s father, Lee Collins, Larry Lederman returns to the role he took on for Israel in the WCE production, balancing his character’s harsh pragmatism with a sad sense of hopelessness. Josey Montana McCoy plays Skeets Miller, the reporter who brings the news of the cave-in to the outside world. Though his vivid descriptions of Floyd’s plight would turn the event into a circus of gawkers and opportunists, he was also the only man small enough to make his way down to where Floyd was trapped, and he had a sincere desire to help rescue him. One of the most poignant and beautiful scenes happens when Floyd asks for a favor before Miller leaves the cave for the last time. Levity opens the second act with a bright specialty number featuring a trio of reporters (Michael Haller, Zach Spound and Michael Byrne) in a ridiculous reporting sequence spouting headlines that become increasingly more outrageous. The well-positioned change in tone – and great choreography – leads into a full-blown media carnival with everyone trying to capitalize on Floyd’s bad luck. Israel also creates a significant amount of tension in his staging of the rescue efforts, the first of which takes place when all of the miners try to dislodge Floyd from the rock and pull him up. Using multiple sections of rope, and by placing the men at strategic positions around the entire stage, you see it happening literally right next to you. The coordination of everyone straining and pulling together to free Floyd creates a moment of complete immersion in the story that was so horrifically powerful, I’ll never forget it. To simulate the intricate underground pathways and caverns, lighting designer Lisa D. Katz, who did the original design for the WCE production of Floyd Collins, uses very specific lighting to define the space and create contrast between reality and the more dreamlike sequences. The openness of Rich Rose’s scenic design allows plenty of room for the imagination to take over while still providing some surprising touches. Without reservation, I recommend that you experience this artistically-rich, exquisitely-rendered production of Floyd Collins. The ensemble work (which also includes Victoria Strong (Miss Jane), Joe Hart (H.T. Carmichael), Jay Donnell (Ed Bishop), and Gary Lee Reed (Bee Doyle), is extraordinary and the vision thoughtfully realized for an intimate audience experience you’ll never forget. It has now taken the top spot on my must-see musical list for 2014. Go see why.